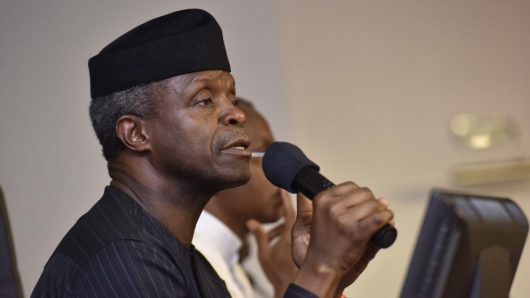 Acting President Yemi Osinbajo has promised that all persons within the law enforcement apparatus who participated in the siege on the National Assembly yesterday will be identified and subjected to appropriate disciplinary action. This assurance came after the sack of the Director General of the Department of State Security (DSS), Lawal Musa Daura. In a statement signed by a Senior Special Assistant to the President on Media and Publicity, Office of the Acting President, Laolu Akande, Acting President Osinbajo condemned the unauthorized take-over of the National Assembly by men of the DSS. This came after Osinbajo met with the ex-DSS boss and the Inspector General of Police (IGP), Abubakar Idris, Idris and the Chief of Staff to the President, Malam Abba Kyari behind closed door. He maintained that “the unlawful act which was done without the knowledge of the Presidency is condemnable and completely unacceptable. Reports that emerged last night say the most senior Director in the DSS, Matthew Seiyefa, has been mandated to take over as the Acting Director General of the agency by the Acting President. Seiyefa, from Bayelsa State, met Osinbajo yesterday evening few hours after Lawan’s sack was made public. Acting Chairman of the Economic and Financial Crime Commission (EFCC), Ibrahim Magu, also was at the Villa to consult the Acting President. Though DSS officers are part of Nigeria Police Force, the Inspector General of Police, Abubakar Idris, has exonerated the Force from the Tuesday’s blockage of the National Assembly (NASS) by security operatives, saying the Police were not involved in the siege. He said the action was a surprise to him. “Police are not involved,” he said. Idris stated this after a closed door meeting with the acting President Yemi Osinbajo at the Presidential Villa, Abuja. “Obviously, like I said, I have not got a detailed brief on that. So, when I get the brief, in fact we are going to issue a (press) release,’’ he said. Meanwhile, the meeting of the leadership of the National Assembly scheduled for Tuesday (yesterday) afternoon has been called off. Although, no new date for the meeting was given, the cancellation of the meeting is not unconnected with the siege by the men of DSS who earlier refused some members of the of legislature access to the building. The Deputy Speaker of the House of Representatives, Yussuf Lasun, who arrived the Assembly a few minute before noon, later emerged to announce the cancellation of the meeting. He said the atmosphere was too tensed to allow for a meaningful meeting of the leadership of legislative arm. According to the Deputy Speaker, the notice of the meeting was sent “through text message. We were called through text message yesterday. Although it was later my attention was drawn to the fact that the message is being streamed by some stations. “But I received a text yesterday from the Senate President that there’s going to be a meeting today by 12 o’clock at the National Assembly in his office. “But when I got here I drove in and I saw a lot of security agents and I don’t just like it,” he retorted. He further disclosed that he had been in touch with the Preaident of the Senate, Bukola Saraki, his Deputy, Ike Ekweremadu and the Speaker of the House, Yakubu Dogara. The other most senior principal officers, such as Senate President, Deputy Senate President, Speaker of the House, Leaders of the Senate, Ahmed Lawan and that of the House, Gbajabimila Femi were all conspicuously absent during the drama. Surprisingly, majority of legislators in attendance as early as 7am were PDP members, while their colleagues from the ruling APC were absent. The Deputy Speaker of the House of Representatives, Yussuff Lasun denied knowledge of the agenda behind the untoward security siege laid on the National Assembly by operatives of the DSS, as well as plan to impeach the Senate President, Bukola Saraki and other principal officers. The Osun lawmakers, who condemned the development, noted that the removal of any presiding officer in the National Assembly is cumbersome and requires two-third majority of all the members. “I’m an APC member. I’m not aware of the plot to impeach the Senate President. “Don’t forget that it is difficult to impeach a presiding officer of the National Assembly; because no matter the method you are going to use, you need the two-third majority – and not two-third of the sitting members – you need the two-third of the totality of members of the legislature before you can impeach anybody,” Lasun told Legislative Correspondents. Some of the lawmakers who reacted to the development, who blamed the PDP members of engaging in cheap blackmail, argued that such campaign will not work. They observed that the request from the President was properly communicated to members. In a statement jointly signed by the two presiding officers of both Chambers of the National Assembly, Saraki and Dogara stated that the heavy presence of armed security men who unnecessarily militarized the legislative complex and harassed legislators and the workers in the complex could not be justified in a democracy. The statement said in part: “The Senate President and Speaker further noted that today was a sad day for democracy as very early in the morning, they got reports backed by video and pictures, from members of staff of the National Assembly, their colleagues from both chambers and other individuals, about the heavy presence of the security personnel who insisted that nobody would enter the complex except certain Senators who were to be conveyed into the complex in a Coaster bus. “By 6.30 am, the reports started coming in and by 7am, there were pictures and video online showing armed security men preventing Senators and Honourable members from coming into the Complex. Some of our colleagues then mobilized other members in both chambers from their respective abode so that they could pressurize the Security men from allowing them to gain entry. “Obviously, the public outcry from Nigerians and members of the international community against this illegality, this desecration of the sanctity of the legislature and this flagrant abuse of powers forced the government to relax the directives given to the security men as they later allowed the legislators to walk from the main gate into the foyer. Still the lawmakers were not allowed to drive in, in their vehicles and were denied access into the main building housing their offices. “Following this unpleasant development, the joint leadership meeting slated for this afternoon has been postponed till further notice; because under the prevailing circumstances, we cannot guarantee the safety of the 20 members from both chambers expected at the meeting”, Saraki and Dogara stated. On its part, the All Progressives Congress (APC) described the incident at the National Assembly as purely legislative matter which has nothing to do with the party or its chairman. In a short statement signed by Yekini Nabena, the Acting National Publicity Secretary of the party, APC said, “Our attention has been drawn to mischievous attempts in some partisan quarters to link Tuesday’s developments in the National Assembly to the National Chairman of the All Progressives Congress (APC), Comrade Adams Oshiomhole. “While the Party is monitoring the developments in the National Assembly like every other concerned Nigerian and stakeholder, there is absolutely no basis for all the false allegations and attempt to blame the APC National Chairman for the development there. It is strictly a legislative matter,” APC said. The Peoples Democratic Party (PDP) advised the Acting President, Prof Yemi Osinbajo to shed the idea of using the sacked Director General (DG) of the Directorate of Security, Lawan Daura as ‘the fall guy’ for Tuesday’s invasion of the National Assembly by security forces. The party insisted that the invasion by the DSS and Police was with the absolute knowledge and approval of President Muhammadu Buhari, Vice President Osinbajo, and the All Progressives Congress (APC), adding that Daura’s sack was an afterthought, diversionary and deceitful. The PDP, in a statement yesterday by its National Publicity Secretary, Mr. Kola Ologbondiyan, said, “The Presidency’s sack of Daura was a damage-control stunt and a knee-jerk gimmick which came as a response to the national and international outcry against the armed invasion of our legislature by security agents as directed by the Buhari Presidency.